You are currently browsing the Gluten Free For Good blog archives for January, 2008. After my New Year’s resolution intention list and my pledge to cut back on sugar, you probably didn’t expect my next post to be sugar-dense dark chocolate fudge. Other than a few minor set-backs, I’m actually doing quite well with my elimination of sugar. But I made these during the holidays with the idea of posting the recipe before 2008, so I thought I’d squeeze them in before I start in on stuff like kale soup and cauliflower stew. Which sounds better? Dark chocolate or cauliflower? Quick, pick one. Okay, so if I had a choice between one of these little gems or a chunk of raw cauliflower, I probably wouldn’t have to think twice before lunging for the chocolate. And now that dark chocolate is being touted as this year’s wheat germ (which we never bought into anyway), I might even be able to make the pick with a clean conscience (except for the sugar part). And, let me tell you, these are good. They’re also a breeze to make. So, here you go. 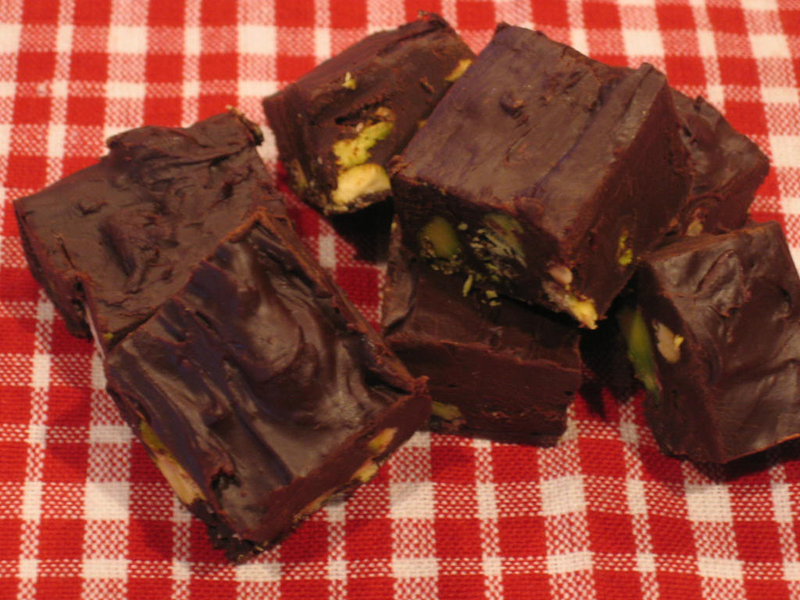 Yummy dark chocolate fudge – unless you’ve made a resolution never to eat fudge again. See, that’s why I suggested intentions. If nothing else, stick this recipe in your files for sometime when you need a quick and easy dessert. One that doesn’t even require silverware. My favorite kind. 1. Using low heat, melt the chocolate, sweetened condensed milk, and salt in a heavy saucepan, stirring continuously. 2. Once blended and smooth, pour in nuts and mix well. 3. Poor mixture into greased 9 inch square pan, smoothing the top. 4. Let fudge cool and then refrigerate until well set. Using a good chef’s knife, cut into small squares and store in the freezer. Serve as needed. They’re great right from the freezer. yak logo and blog. His inspiration for the yak came from my sidekick, Fairbanks. Highlighting Mike’s January page on my blog is a perfect way to welcome in New Year’s Day. And who knew it was National Soup Month? That little piece of trivia might become a recipe theme for me this month. 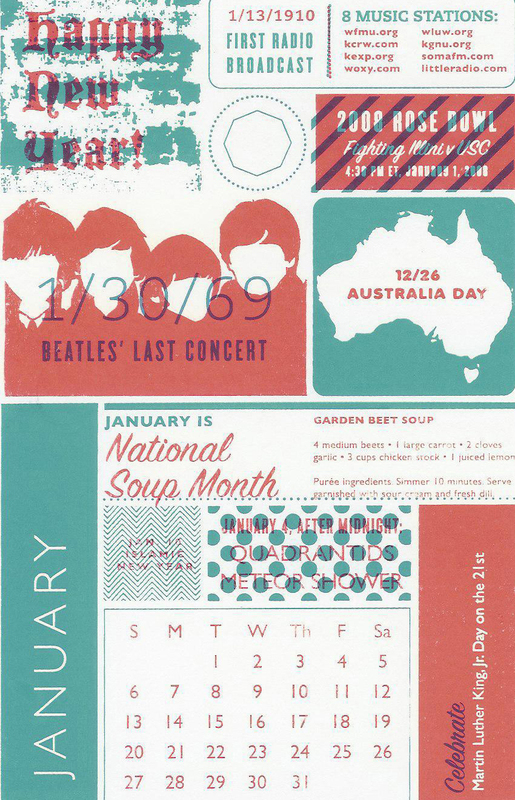 The Beatles’ last concert was in January of 1969? No way. Anybody know where? Okay, so I have to add the October page to today’s post because I can’t wait nine months to show you this. 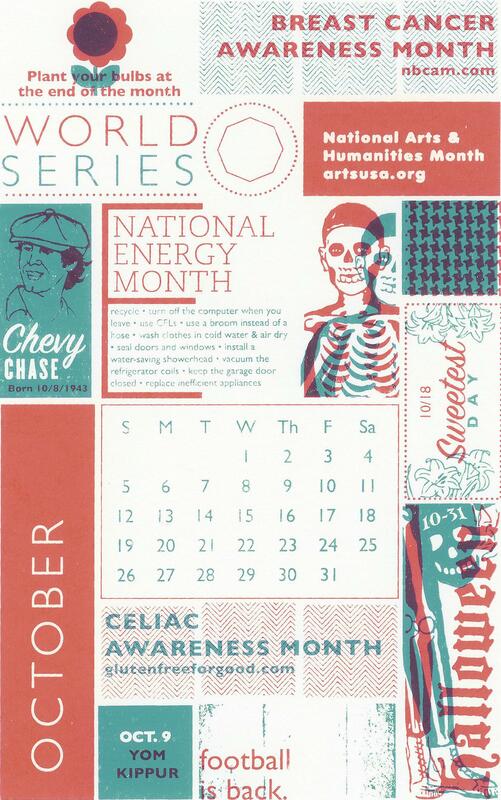 October is Celiac Awareness Month and isn’t it cool that Mike’s promoting our cause and he doesn’t even have celiac disease (although there is more to the story). Anyway, I love this calendar and had a blast reading the monthly trivia – not to mention marveling at the thought that he made each one of these calendars by hand (all 200 of them). Thanks Mike! On to 2008 and a new batch of resolutions. No, no, no. I prefer the word intention rather than resolution. Listing resolutions is a sure-fire way to be fed-up with yourself by January 3rd or 4th. My online dictionary describes resolution as “a firm decision to do or not do something.” Resolutions are firm decisions on New Year’s Eve after a glass or two of pinot noir, but usually come to a screeching halt when you’re starving and facing down a gluten-free dark chocolate bar while waiting in the checkout line at the grocery store. And you’re sure it’s GF because you just read every word on the wrapper and you know what to watch out for – stuff like hydrolyzed vegetable protein or maltodextrin or carmel coloring. Whew (or bummer), nothing you need to avoid. Other than sugar, which was a do not touch in 2007 resolution. Wasn’t it? Hmm, maybe not. I don’t recall. Then you have that annoying conversation with yourself all the way home (as you eat the chocolate bar). Blah, blah, blah – why am I eating this – blah, blah, blah – I only made it two days – blah, blah, blah. Or what about when you’ve “resolved” to do 30 minutes of cardio every other day and that lasts all of a week because everyone else has the same resolution and going to the gym to fight for your 30 minutes on the stairmaster simply adds to the stress you resolved to reduce. Why do we do this to ourselves, anyway? Well, that’s the thing – we don’t have to. So, here is my modest list of intentions. And I really mean it this time. 1. Eat a healthy, full-spectrum breakfast every morning and cut way back on sugar. I’ll have more on both these intentions in my next few posts. 2. Adopt the word movement rather than exercise (and this coming from a person with a degree in Exercise Science). Movement includes anything that involves moving your body. It could even mean jumping up and down, stomping your feet, and scolding yourself for eating the chocolate bar – or waving your arms around when you talk. Take your dog for a walk, go for a hike, ski, swim, play tennis, take salsa lessons. It doesn’t matter, it’s all movement and that’s what we need. And lots of it. Never stop moving. 3. Sleep, sleep, sleep. Aaahhh, we all need more sleep and I’ll go into detail why in an upcoming sleep post. 4. Take up yoga. If you only have time to do one thing, I believe yoga is your best choice. Balance, strength, flexibility, heart-health, hormonal balance and increasing mind/body awareness all help you stay fit and healthy as you age gracefully. 5. We all know this one – cut down on stress! And I will start by leaving this post at 5 things to think about – 5 intentions to start my New Year off. And maybe yours too, but don’t stress about it.